I looked at the forecast. Rain for the next 10 days. After the initial panic had passed I decided I needed a game plan. 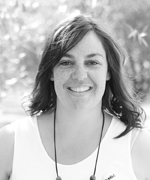 2 kids, no backyard… what to do? Now, don’t get me wrong, I love jumping in muddy puddles. On wet days that usually happens right after dinner just before bath, but I needed some ideas for the other 10 hours. Why not challenge your little ones to do something different inside, try out a craft, recipe, or game that wouldn't have otherwise interested them. Show your kids that being stuck inside isn't always a bad thing — it can be a great opportunity to learn something new! Here are some great ideas to bust the boredom and to side-step the “I’m bored, there is nothing to do” whinging. Every kid loves playing in a cubby; an indoor fortress. Grab some chairs, sheets, blankets, cushions and a HEAP of pegs and get building. Encourage your children to use their imaginations – they can create rooms inside with towels and other furniture, dress up and even have a picnic in the cubby for lunch. This activity is hours of entertainment for any age, and especially great fun when you have friends over for a playdate. If you aren’t keen on having the ENTIRE contents of your linen press emptied, then have a think about something a little more permeant; a cubby ‘condo’ like the one below. 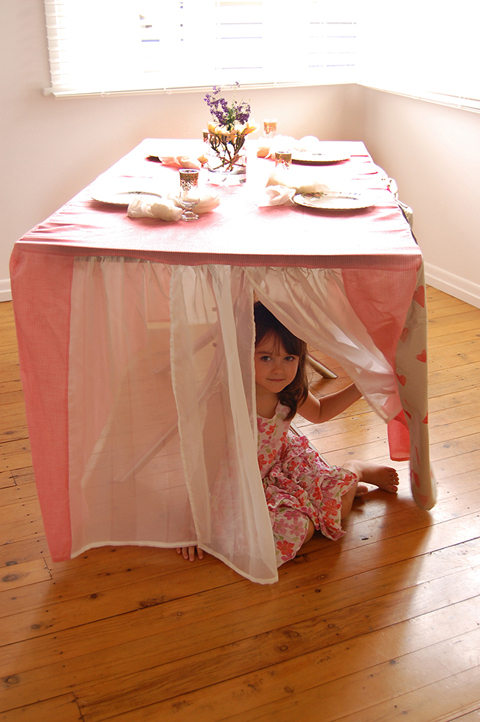 It’s easy to set up, just throw it over the table and voila, you are done! No need to remove for lunch time; you can just set up on top of it. You know much fun it can be when you are cleaning up a room or a drawer and all the fun and distracting things you can find; old toys that the kids had forgotten about (instantly making them brand new toys in their eyes) or even postcards or mementos from old holidays. Make it a game and ask your helpers to see who can get it done the fastest. Give them an item, tell them where it goes, and count out-loud. When they get back greet them with a high five and in my case a “BAM! That’s how it’s done”. While in your cubby house of fun, pull out a huge pile of books. If you are lucky enough to have a tin roof you can lie in there listening to the rain on the roof while reading through your favourite books. 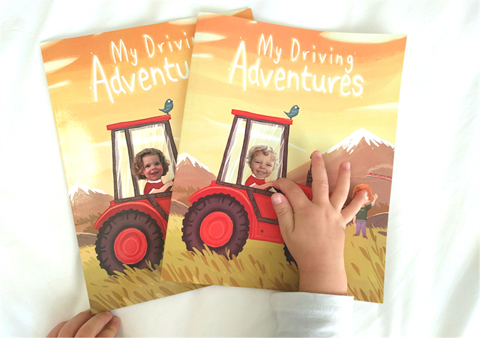 My son recently turned 2 and I always love to get something really special and personal for a birthday and as my son LOVES (actually, is obsessed with,) anything with wheels, I bought him a driving story book with a twist. He is in the book! When we started reading he looked at me like “is this a joke?” then screamed out “Meeee!” Let’s just say we have already read it 15 times and we got it 3 days ago… it’s a keeper! Go outside! It’s only water. Try your hand at some splatter painting. Drip some food colouring onto pieces of card (remember it’s going out to get wet so the thicker the better), get on the rain coat and gumboots and send your kids out. They pop the card on the ground and watch the rain do its magic. For the full ‘how to’ blog by little page turners, click here. Yes ok, fine! It’s not Easter but still this is a fun any-day-of-the-year activity. This can be an activity for all ages. Older kids will able to grab a pen and just go for it, but with the younger ones you can help them or even use a modified version where you ask them to collect things of a certain colour. A quick Pinterest search will give you some great ideas on what to add to the list. Click here for some inspiration. 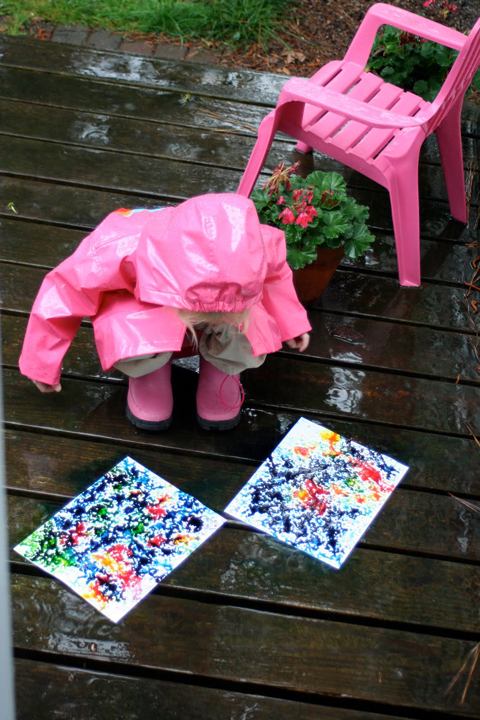 Do you have a go-to activity when it is wet to keep the kids entertained and cabin fever at bay? Let us know.